Justice Mojisola Olatoregun while admonishing Jacobs, told him to stop his “Jankara Market law practice,” but in a swift reaction, the prosecutor told the judge that he took exception to the word. The fierce altercation lasted for five minutes before the proceeding continued. 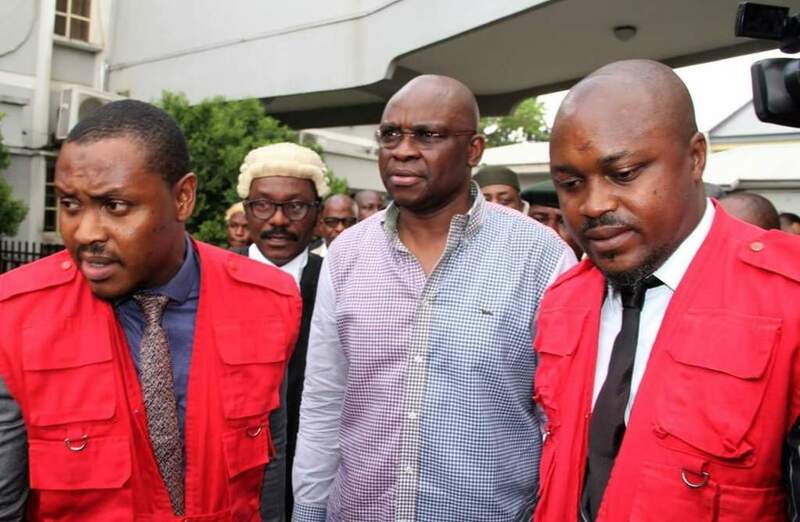 Fayose was on October 22, 2018, arraigned by the Economic and Financial Crimes Commission (EFCC) alongside his company, Spotless Limited, on an 11-count charge of alleged N3.3 billion fraud. He, however, pleaded not guilty to the charge and was subsequently admitted to bail in the sum of N50 million with one surety in like sum. At the proceedings, the prosecutor, Jacobs led three foreigners, Joseph Bosen, Joseph Michelle and Marun Michelle the Evidence in Chief, on account of their role in the purchase of a property on Victoria Island Lagos. Marun Michelle said J J Technical Service Limited is owned by his brother-in-law, Joseph Bosen and Joseph Michelle, and the duo gave him the power of attorney to source for contract for the firm and it was in the process of seeking for contract from Ekiti State government that he gave the company’s detail to Abiodun Agbele. “I’m the Managing Director of Samchese Nigeria Limited; we are into construction. I knew the defendant, Ayodele Fayose as far back as 2006 when he was a governor, and I also knew Abiodun Agbele very well; he does help me to get contact from Ekiti State government, and I do appreciate him for helping to get contact from the state government, base on our relationship. “Agbele told me he needed a company to secure a contract, and I gave him details of J J Technical Service Limited but he did not get any contract for J J Technical Service Limited. “Agbele later brought documents for me to sign; I don’t know the content because I can not read English except Arabic but later discover that the documents I sign were for the acquisition of properties in Lagos. “When EFCC invited me in respect of the properties acquired with the name of J J Technical Service Limited, I called Agbele to inform him of EFCC invitation and he told me to lay claims to the properties. “At EFCC office in Lagos, I wrote two statements, in the first statement I laid claim to the properties in question as directed by Agbele but when I confessed to my lawyer that I lied in the statement, he advised me to go and confess by saying the truth; so, with the aid of my manager, Essien Charles, I wrote another statement, and I gave truth account of how the properties were acquired by Agbele with our company despite not seeking our consent or approval,” he told the court. Under cross-examination by Fayose’s lawyer Adedayo Olanipekun, he lawyer prayed the court to admit, the first extra-judicial statement made by the witness as an exhibit and the court granted the prayer. Under re-examination, the prosecutor, Jacobs sought to tender the second extra-judicial statement of the witness but the defence lawyers raised an objection to its admissibility under re-examination and the court sustained the objection raised. Justice Olatoregun told Jacobs that he was not competent to review her ruling, adding that if the EFCC prosecutor was not satisfied with the ruling, he should approach the upper court instead of reviewing her ruling. The prosecutor in his response told the judge that he took exception tothe word used to address him, adding that in decades of his law practice, no judge had ever used such word to address him. Further hearing in the trial has been adjourned till April 15.